i b i k e l o n d o n: Tally ho! 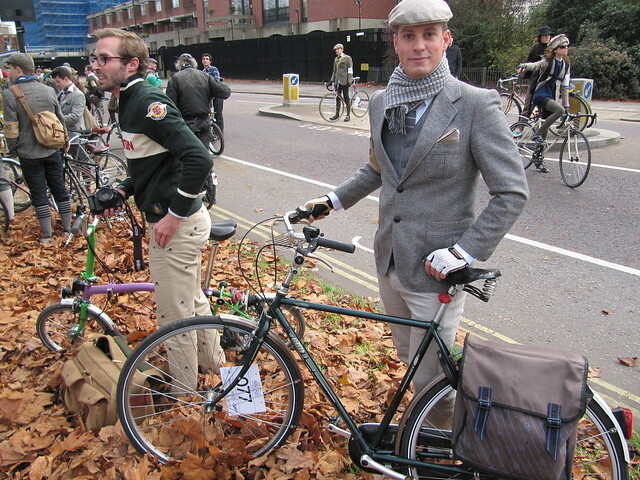 It's the Tweed Run! Tally ho! It's the Tweed Run! On Saturday I joined 300 or so finely attired folk for a metropolitan bicycle ride with a little bit of style - it's the Rugby Ralph Lauren Tweed Run! My video of the day which hopefully encapsulates the sense of fun we all had. I unwittingly shot a number of celebrities who were participating, not to mention some well known cycling scenesters.. see if you can spot them! We set off from the new flagship Rugby store in Covent Garden where tourists stopped agog at the spectacle unfolding in front of them, before winding our way past some of London's most famous landmarks and through some of our most beautiful streets. The ubiquitous tea stop took place in Chelsea (fanciest portable toilets EVER!) before a loop via south London to the finishing party at a private member's club near Buckingham Palace. Prizes were awarded to Best Dressed Riders, Best Vintage bicycle and the Doff of the Cap Award for most gentlemanly conduct on the ride. One luck raffle ticket holder walked off with a brand new Pashley Club Man to the envy of every one else, before we danced the night away to a swing band. I might start dressing like this every day! As always an incredible time was had by all, money was raised for the charity World Bicycle Relief and thanks must go to the organisers, sponsors and volunteer marshalls for holding such a successful day. Stay tuned to the Tweed Run website for details of the 2012 ride! Tally ho! "some well known cycling scenesters", any chance of pointing then out to those of us outwith London? Hello Kim, if you're from out of town you probably won't know them, but Amy Fleuriout from Cyclodelic is in there as is Lady Velo from Velo City Girl. And that's uber famous super model Erin O'Connor at the 1 minute mark. I think some of the cast of Made in Chelsea are in it as well, but wouldn't know to be honest! It's about time Edinburgh had a Tweed Run I think Kim! Lovely video, thanks for posting it! Spotted Fleur de Guerre there too. Thanks Beth! Fleure de Guerre and her friends (the Vintage Style mafia!) looked incredible on the day. I don't know how they managed to keep their composure with all of the photographic attention they were getting. Not from London but super film. Spiffing music too! How are the plans for January developing? I love the tune as well, what is it? I think you should start dressing like that every day! @Andy in Germany; indeed, this being a London event there was the typical diversity that you'd expect of our fair city. Everyone was getting along and EVERYONE was equally well dressed! @Deborah I reckon you could rock classic and cool at the same time on your Bianchi. The tune is by a French group called Caravan Palace; check out some of their videos on Youtube, they rock! Thanks for the tip, I'm listening to "Suzy" right now - you're right, they are brilliant! (funky videos too) "Jolie Coquine" reminds me a bit of DAAU, do you know them?